Here is a list of all entries to King Mins Kyrat. With this trick you can very quickly farms skins of many predators. 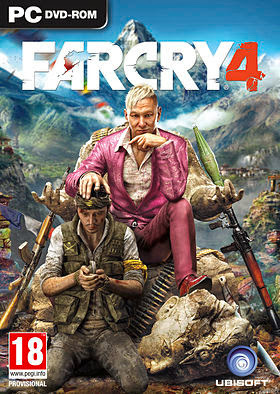 It is believed the best elephant bush (with the Far Cry 4 Gold Edition free in store) or other strong weapon. You go now somewhere in the neighborhood of an outpost (in the forest often come just the same animals and at the outpost, you can quickly buy new ammo) and then puts a bait. Now comes a Carnivorous animals (King Tiger, Bear, Dhole, honey badger, etc.) and you can kill it with one shot with the elephant gun. As a final molt the animal. You will now receive the fur and a new bait and can be repeated as long as the whole until you have no more ammunition. The easiest way without being constantly involved in combat is the Gyrocopter. Now you can comfortably make the whole map behind and fly radio tower radio tower. You can fly directly to the top platform and turn off the bell tower to avoid having to climb even with the little thing - usually the copter but then plugged firmly or is no longer out of the tower. Just quickly go back to the first outpost board the next flight ability and on to other towers. Who wants to quickly learn the skills (attention, some require a number of conditions), I can only recommend to reset the already occupied outpost. For each outpost, which you shall possess undetected and without alarm, you will receive 1500 experience points. But is also a question of money, because that can go into the ammunition. But it's better than making several side quests in a row where you get much less. Have fun skilling. Should you have Pagan Min shot down in the last mission in his helicopter, then goes back to the royal fortress. Now destroyed the gate that blocks your way to the royal palace (C4, grenade launchers, ...) and run as long as in the direction of the palace until you see a burnt helicopter wreck. In addition, the dead Pagan should be. Looting him we obtain 250,000 rupees immediately and also "Pagans Golden filler" worth 300,000 rupees and "lapel pin # 2" worth 350,000 rupees. Do you have difficulty finding the Yalung masks, and runs around forever in blue makiert circle? Move it with the camera now in the blue region round about, and you will show a yellow square end finish that reveals to you the position of the mask. The same works even if you should not find a propaganda poster. This requires that you own the house Ghales, it turns freely after 2 Yogi and Reggie missions. Here you can buy the house Upgrade garden. Now you just need the ability harvesters from the talent tree elephant. You reap from all plants, changes via fast travel to any other point and then back to the House of Ghales. Now you harvest again from all plants. When you have done this alone 4 times you get together to raise funds for merchant 200,000. The fastest way to get karma by using the machete or arrows just bolt through the handle of animals. It is best to take the repeating crossbow which will open later in the story progress. It goes where there are snow leopards to a location on the map. Now search for one bush and hid ducked it. You throw a piece of meat and a snow leopard appears. This is done with the repeating crossbow and immediately gets 50 karma. If you collect the fur where it now collects 2 skins, one has in pastry 16,400 of money with you after you have sold it. The best one is this repeated as often as you like you can in a few minutes 1000e in karma and collect money together. You got 300 Karma and furs worth 49,200 of money. South of the village BANAPUR are the KYRATEA terraces can be reached after liberation by fast travel there green plants for syringes grow a lot of plants, including many green when I approach a heavy contract once traveled briefly then harvested and ready to go, it is a cinch to to30 and more crops with short memories and re-start when the ability was -ERNTER-learned doubled the number of harvest. If you want a weapon that you have not yet but unlocked or not have enough money for that weapon, then go into the coop. If a friend of yours or another player have this weapon you need to kill only an armed people. Then, the other player can drop his weapon by exchanging it with the one person dead. Now you exchanged from one of your weapons with the lying on the ground and you have the weapon unlocked. The other player has to do is go to an armory and equip the weapon again. If you have no desire all the time walking around with the camera, you just injected a syringe hunting. Then opponents are automatically marked at the outpost and so you can take it easier. Skillt best right at the beginning that you suddenly get 2 plants so you can restore it easily. When hunting should always be the prey or similar with binoculars be marked before is slammed. If the animal flees now, you do not lose sight of it and is able to pursue it. Because nothing is more disappointing than the long-awaited prey to lose because the shot went wrong or the animal has only injured. Easy walk to the poster to destroy! Some of the posters are not within walking distance, the easiest way is to destroy them with a fire arrow easily target and without raising large attention, of course, it goes well with Molotov or rocket launcher etc, but as you can you to quietly this task without worry opponents to draw attention to yourself. Of course, good to go unnoticed to create a diversion.